I decided to take part in the Bread Baker’s Apprentice Challenge led by Nicole of Pinch My Salt. 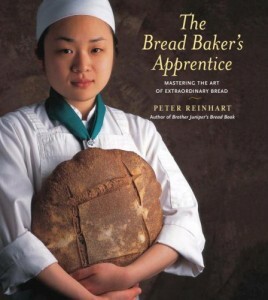 Each week we will bake a recipe from the Bread Baker’s Apprentice cookbook by Peter Reinhart. We showcase our work via flickr, twitter, and the blogosphere. I am doing this as a challenge to myself. I will stick to the program and learn new skills. I will not be sharing the recipes, for the most part, just the techniques used. I encourage you to buy this book as well. You can find the book here on Google Books – many of the recipes are searchable. Last week I baked the first bread on the list, the Anadama bread. The Anadama bread is traditional to New England. I started off the bread with a corn meal soaker, turning the corn meal into mush. I have never used or made a soaker before. These are the kinds of recipes that I have always shied away from. I let the corn meal sit all day – mushing. When the liquid was absorbed, I began to create a yeast and flour based soaker to which the corn meal mush was added. I let the starter ferment for an hour. I then added the rest of the flour and the special ingredient – the molasses. When I put the dough aside to let it proof, I had to keep myself from peeking under the towel. It doubled in size. I was thrilled. After shaping the loaves, I let it rise some more. Then into the oven it went. It came out perfect. I had to hold back and not eat the whole loaf. The bread is excellent toasted with butter, or toasted with avocado and turkey. Yum. Check out #BBA on twitter if you would like to follow along with us, or just keep coming back to the blog. Stay tuned for the Artos bread coming soon! Congrats on the successful loaves. Good luck on the Artos. The color on your Anadama is beautiful. Great work, and good luck on the Artos! Great work, Hindy! Beautiful bread.